Before I start this review, a warning: this game deals strongly with the theme of suicide. Please leave this page now if you don’t feel comfortable reading about this subject. Of the several RPG Maker games I played or watched during my marathon RPG Maker spooky game session a week ago, Blank Dream was both the best and the most emotionally moving. If I’m being totally, completely honest, I got all verklempt when I got to the true ending of this game. I was a little bit choked up, which is a thing for me, a person who has not gotten emotional at either an artistic work (minus possibly one) or a personal circumstance for over a decade. It may be that I’m an emotionally stunted man – I almost definitely am – but it may also be that Blank Dream is just that good. Blank Dream tells the story of Mishiro Usui, a high school girl who faces bullying and abuse at school and extreme pressure from her family at home. These stresses drive Mishiro to kill herself by drowning in a lake. When she wakes up in a strange shadowy world, however, Mishiro has no memory of who she is. By looking into mirrors scattered around this limbo she’s found herself in, Mishiro slowly recovers her memories and realizes the wish that led her to commit suicide – her desire not only to die, but to erase herself entirely from existence. The above description makes Blank Dream sound like a bleak and lonely game, and in some ways it is. 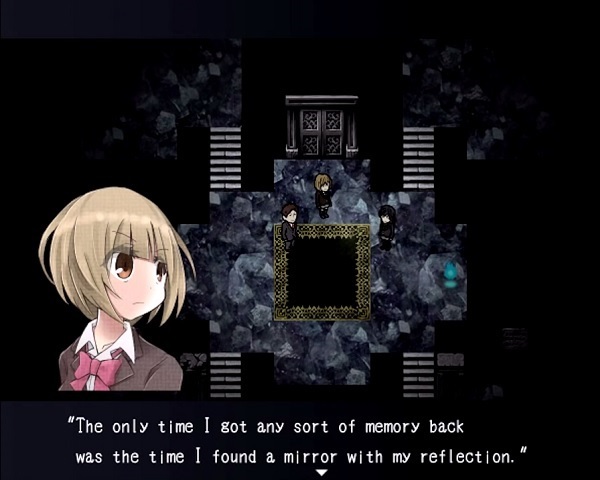 The mirrors that the player has to find are located in parts of limbo with names like the Realm of Spirits, the Realm of Blood, and the Realm of Death, and in typical RPG Maker horror game fashion, each of these realms contains puzzles that the player must solve and enemies that must be avoided. However, Mishiro also is joined in her search by two other dead characters: Ryotaro, a professional-looking guy in a suit, and Yuzu, another high school-aged girl who claims to have been stuck in limbo for several years. 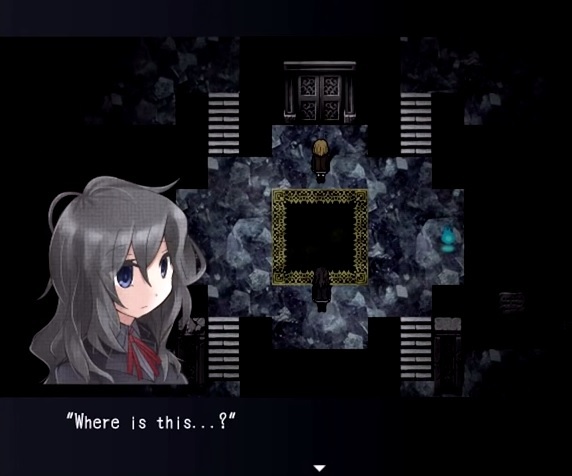 These characters also have mirrors that the player can find, and their stories are intertwined with Mishiro’s. As described above, Blank Dream involves many heavy themes. Certain characters contemplate and talk about stress, depression, and suicide. 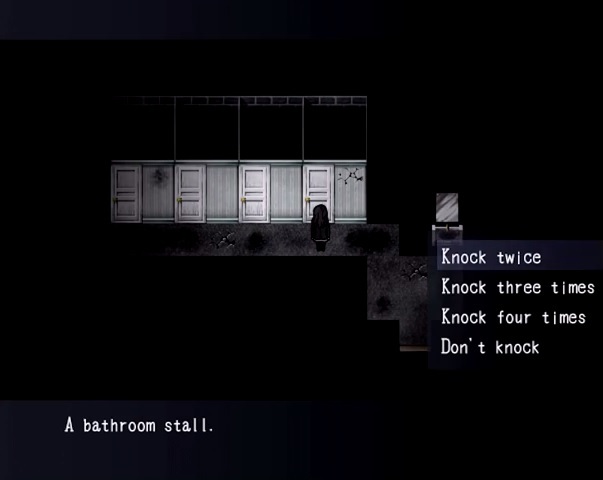 It’s easy to imagine how a game creator could screw this up badly, because Blank Dream also contains the kinds of jumpscares and chase sequences involving spirits and monsters that could cheapen the experience (a problem that the otherwise good RPG Maker horror game Misao suffers from.) However, Blank Dream doesn’t suffer from these kinds of abrupt tonal shifts. Unfortunately, I can’t really say anything else about the game without giving away spoilers – Blank Dream is that kind of game. So all I can do is recommend it. 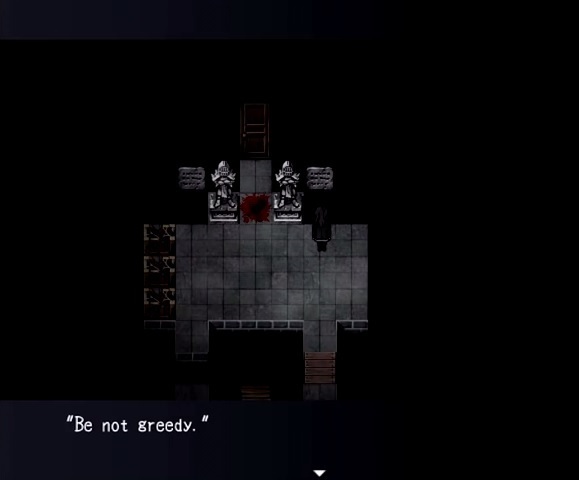 If you’re looking for a really well-made RPG Maker game that has good puzzles and a great story, and if you don’t mind playing a game that deals with suicide and other heavy themes, Blank Dream is made for you. Blank Dream was produced by a company called Teriyaki Tomato (yes, really) and an English version of the game can be downloaded here. Despite technically all being “horror games”, the games we played in our weekend RPG Maker marathon varied pretty widely in theme and approach. And while it wasn’t the best among the games, Bevel’s Painting was certainly one of the most interesting. Made in 2015 as an entry in an independent game contest by one Maninu, Bevel’s Painting tells the story of Bevel, a young white-haired girl who enjoys painting. There’s not much in the way of dialogue in this game, and Bevel is a silent protagonist, so a lot of the story is implied, if that makes any sense. Here, we know Bevel is a budding artist because she starts the game in an art classroom in front of an easel with a painting on it, and also because she wears something that looks like a beret. 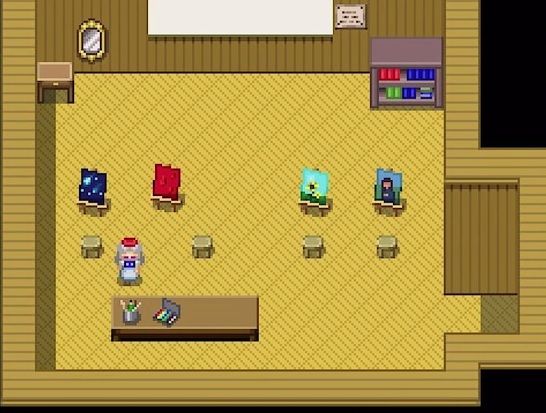 Other than that, the game initially gives you no direction or narration, and Bevel’s classmates standing around in little cliques in the hallway outside the classroom won’t talk to her, so the only place to go is naturally inside the painting on the easel. The great bulk of Bevel’s Painting takes place inside the “world” of Bevel’s painting. Bevel has to navigate through various puzzles and traps to progress through her world. While her art world starts out bright and happy (in a sequence that occurs shortly after entering the painting, Bevel is magically decked out in a princess outfit by animals and gets applauded by a crowd of colorful bees, worms, and alien-looking creatures) it doesn’t stay that way for long. This is a horror game, after all, so it’s no surprise when the initial cheeriness of the game fades away into darkness and terror. You can also expect to be chased by enemies a few times – and yes, you can die in the painting world if you’re caught or if you fall into a trap. And like most games of its type, Bevel offers a number of endings – which ending you get depends upon several choices you’ll have to make when deciding how to solve the game’s puzzles. 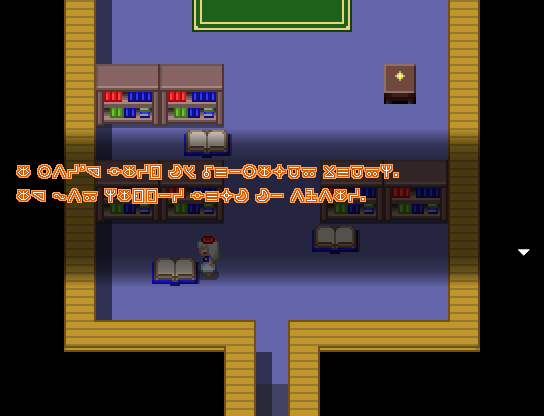 The game also features a language gimmick: most of its text is in “Bevelese”, which is English with its letters replaced with gibberish symbols (the game helpfully offers a guide in the download file to help the player decode the language.) The Bevelese thing does come as a surprise at first and can be a little annoying, but we quickly got used to it while playing, and the concept of a made-up language within Bevel’s art world makes sense in the game. Out of all the games I played/watched throughout our marathon horror RPG Maker game sessions, Bevel gives you the least information by far. The game drops clues about where to go and what to do, but you have to use your mind to make the connections and solve the puzzles necessary to moving forward. It also gives very little away about the story behind Bevel’s explorations – at least at first. Bevel is (debatably) the only “real” character in the game, not counting the various creatures and beings you’ll run into during your playthrough. The game doesn’t provide much in the way of dialogue and provides no narration whatsoever. However, the game does provide serious hints later on about some of the issues Bevel might be trying to work through. Without spoiling too much, I can say that the game goes into seriously dark territory near the end – although it never explicitly states anything about its protagonist, her experiences, or her feelings, they can be guessed at by the end of the game depending upon the ending route you’re locked into. Bevel’s Painting goes far more for ambiguous creepiness and unease than it does for cheap scares, and that’s something I appreciate. All in all, Bevel’s Painting is well worth playing. 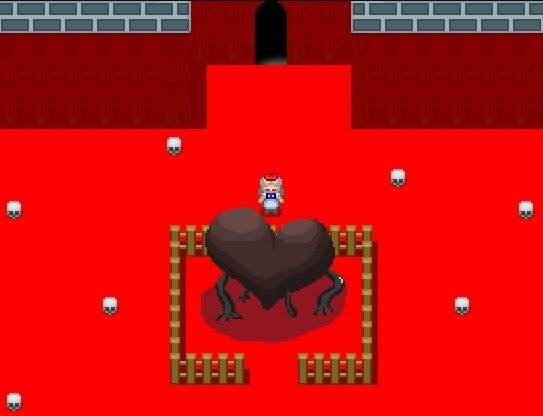 The game clearly owes a lot to Ib and Yume Nikki, two popular RPG Maker games that involve exploring mirror-universe painting-worlds and bizarre dreamscapes respectively. Unlike those games, Bevel is very short – a full playthrough can take less than an hour depending upon your puzzle-solving and being-chased-by-a-monster skills. Despite its short length and its ambiguous endings, though, there’s enough here to make the player feel that he’s achieved something by the end, at least if he manages to get one of the non-bad endings. It’s not a terribly big or ambitious game, but Bevel is good enough to get a strong recommendation. It doesn’t feature a lot of spooky ghosts or JUMPSCARES, but if you’re looking for a bizarre little exploration game with horror elements, Bevel’s Painting is for you. Maninu’s game was translated into English (except for the Bevelese parts) by vgperson and the English version can be downloaded here.